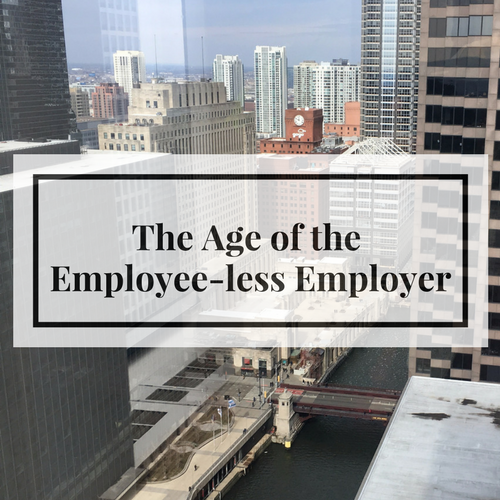 The Age of the Employee-less Employer | Challenger, Gray & Christmas, Inc.
Contract work is difficult to measure. According a 2005 report from the Bureau of Labor Statistics, the most recent data, contingent workers make up 2 to 4 percent all workers, with 7 percent categorized as independent contractors. However, a separate report from the Government Accountability Office calculated contingent workers, encompassing day laborers, temp agency workers, part-time workers, and independent contractors, comprise 40.4 percent of all workers in 2010. In addition to the increased use of outside vendors, an increasing number of companies are turning to automation to eliminate operational costs. This trend is expected to eliminate between 9 and 47 percent of jobs in the United States, according to a report released by the White House in December. The same report predicted as many as 3.1 million car, truck, and bus driving jobs will disappear with the advent of self-driving technology. The use of contractors has been a long-time practice in industries such as manufacturing and aerospace. However, the breadth of the contractor model at large firms in almost every industry from finance to tech is unprecedented. “Contractors inevitably learn operations, sales strategies, customer profiles, etc. Even with non-competes and non-disclosures in place, contractors will take this knowledge to their next companies,” noted Challenger. A report published in the Wall Street Journal pointed to Google’s use of contract labor, making up almost half of all workers. These workers fulfill duties such as testing self-driving cars, reviewing legal documents, and working on various product development in the company. “These are no small tasks. Contract workers at companies like Amazon and SAP also work on various software creation, which may or may not succeed at the company. This is valuable corporate knowledge,” said Challenger. The phenomena is not relegated to tech companies alone. Companies in other industries are using contract work as a placeholder for automation, according to the Wall Street Journal report. The report identified bank BNY Mellon, who in January told investors that 150 bots are in production to replace workers and increase the revenue per employee ratio. Meanwhile, the Metro of Washington, DC is increasingly shifting to contract workers, sparking concerns from permanent employees and union officials of privatization. These jobs may be eliminated further as new technologies for self-driving transportation is created and perfected. The loss of corporate knowledge and American jobs are not the only concerns, according to Challenger. Companies should also consider the impact these trends have on their brand reputation. One airline recently boasted that it outsources almost every job that is not customer facing, including baggage delivery, heavy maintenance, reservations, catering and many other jobs. “These jobs may not be customer facing, but if any one of these services contribute to a poor experience for a passenger, the blame and loss of reputation will fall on the airline, not the contractor. So, when a bag gets lost, a reservation is incorrect, or a mechanical issue causes a delay, Virgin can easily replace the vendors, but it cannot easily repair the damage done to its image,” said Challenger. “We still may have over a decade before automation replaces millions of skilled workers, but increased outsourcing to vendors and contractors is already replacing permanent employees and having an impact on the way companies do business. The cost savings cannot be denied, but it is critical that organizations also consider the risks, including the significant loss of institutional knowledge, as well as the potential impact on one’s brand and reputation,” Challenger concluded.